These rarely seen images are from a series documenting the damage and devastation that was caused to towns and villages along the Western Front in France and Belgium during the First World War. 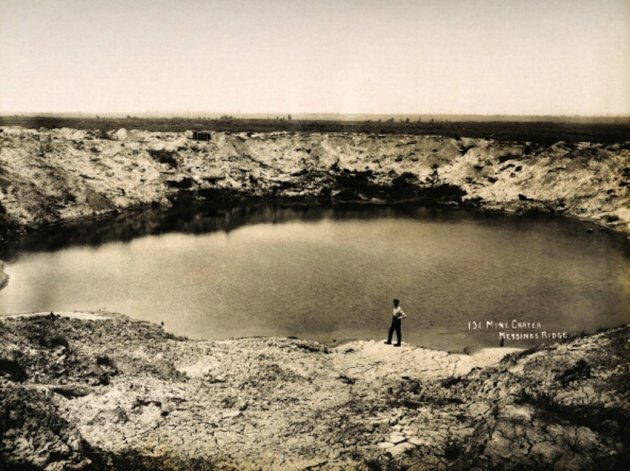 That's a bomb crater from WWI? That was a great find and a slideshow worth going through. Actually that is from a massive bomb planted in a mine that the Allies dug under the German trenches on the Western Front. The trenches were a stalemate and the Allies were getting desperate. They actually "drafted" the men that built sewers in England to dig this mine. Both sides though of this, but the Brits beat the Germans to the punch. It was said that the explosion was so loud, it could be heard in London. That means you're gayer than AHC and Rockpup combined.